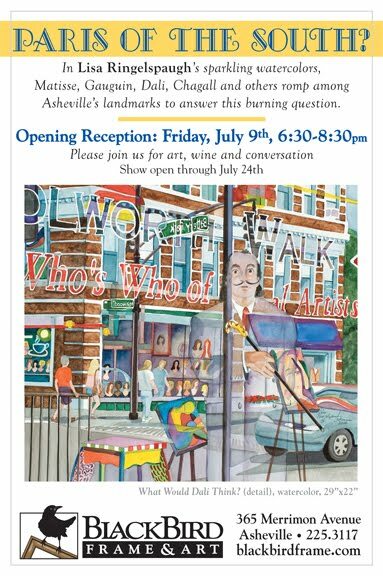 If you have lived in Asheville for any length of time you have most likely heard Asheville compared to Paris. Who knows? Maybe there is something to it... after all, Asheville is a very romantic place, and there is no lack of culture, diversity and nightlife. Our city has played muse to many notable artists, crafters, poets, and writers. Recently, we even had our own art heist just like the famous museums of Paris. Lisa Ringelspaugh is a longtime resident and professional painter known for her lively watercolor interpretations of local landmarks. Inspired by turn-of-the-century Paris, Lisa asked herself, “If those artists visited Asheville, then what would happen?” Her new “Dream Series” answers with a touch of whimsy, a healthy dose of imagination and plenty of artistic license. Through Lisa’s brush, Matisse, Gauguin, Chagall and Dali have finally come to visit our fair city and have reinterpreted their favorite works in a new southern Appalachian light. “Paris of the South?” is a fun, artistic romp through the city of Asheville, from Kim’s Wig Shop to the S&W Cafeteria, and certain to bring a smile to your face. Join Lisa on Friday evening for a special night of wine, refreshments, and stimulating conversation. The Asheville Convention & Visitors Bureau is reaching out to the Gulf Coast in an effort to provide some support in the wake of the Gulf oil spill. A recent Washington Post article noted how challenging fundraising has been in the wake of the Gulf oil spill. According to the article, the Chronicle of Philanthropy reported that $4 million has been raised so far to assist with efforts in the Gulf compared to more than $6 billion that went to the region in the wake of Hurricane Katrina. As a strong outdoor and conservation-minded community, Asheville’s tourism community is deeply concerned about fellow tourism destinations along the Gulf Coast. Many of the partners here have direct relationships with fellow tourism destinations in the Gulf region and want to help. Thanks to the generosity of private tourism partners, every visit to AshevilleTourismCares.com will earn a pledge of 10 cents per visit–up to $10,000–between now and July 2. Funds will be given to the National Audubon Society to assist in the short-term and long-term challenges of restoring the Gulf Coast ecosystem. The Asheville law firm of McGuire, Wood & Bissette, P.A. is pleased to announce that the American Bar Foundation has selected Thomas Grella as a Fellow of the Foundation. Selection as a Fellow is recognition of a lawyer as one whose professional, public and private career has demonstrated outstanding dedication to the welfare of the community, the traditions of the profession and the maintenance and advancement of the objectives of the American Bar Association. The American Bar Foundation is an honorary organization of lawyers, judges and legal scholars nominated as Fellows by their peers. The Fellows support the research of the American Bar Foundation through their annual contributions, and sponsor seminars and events of direct relevance to leaders of the legal profession. 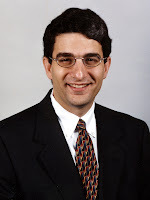 A business attorney whose law practice focus is on commercial transactions, Grella publishes a blog on legal issues facing North Carolina businesses at ncbusinesslawblog.net . An attorney with McGuire, Wood & Bissette since 1988, and a partner since 1993, Grella is chair of the firm's Management Committee and is a past Chair of the ABA Law Practice Management Section and is presently serving on its Executive Committee. He is serving a three-year term in the American Bar Association House of Delegates and is a fellow of the College of Law Practice Management, the National Institute for Teaching Ethics and Professionalism, and the ABA Young Lawyers Division. 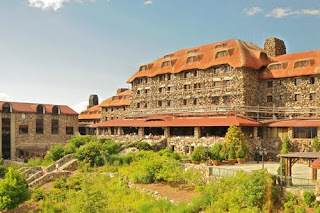 The Asheville Area Chamber of Commerce celebrated 113 years of serving the business community at its Annual Meeting presented by Carolina First Bank on Monday, June 21, at The Grove Park Inn Resort & Spa. Awards presented included two HomeTrust Bank Small Business Leader of the Year Awards (one for 15 or less employees and one for 16 or more employees), the Webb Investment Services ATHENA Award, Asheville Savings Bank Excellence in Public Service Award, Mission Hospitals Good Health – Good Business Award, the William A.V. Cecil Leadership Award, and the Four Season’s Chamber Volunteer of the Year Award. Small Business Leader of the Year Awards are presented each year to two individuals who reflect quality and dedication in their business operations and who are accomplished leaders in innovation, initiative, and civic responsiveness. Bob Kendrick, owner of Kendrick & Associates, received the award for Small Business Leader of the Year in the category, “15 or Fewer Employees.” Michael Shore, partner of FLS Energy, was recognized as the Small Business Leader of the Year in the category, “16 or More Employees.” HomeTrust Bank sponsored the Small Business Leader of the Year Awards and Dana Stonestreet, President, made the presentations. The ATHENA Award is presented annually to a woman or man who has attained the highest level of professional excellence in business, and who has served as an advocate for women in business. Celeste Collins, Executive Director of OnTrack Financial Services, was the recipient of this year’s honor. Webb Investment Services sponsored the ATHENA Award and President Laura Webb made the presentation. The William A.V. Cecil Leadership Award recognizes a leader of the tourism industry in the Asheville area. Mark Rosenstein was recognized this year. Rosenstein is the former owner of the Marketplace Restaurant and served on the Tourism Development Authority board for eight years. The award was presented by Michel Baudouin, owner of Bouchon French Bistro and the Chamber’s Vice-Chair for the Convention and Visitors Bureau. The Asheville Savings Bank Excellence in Public Service Award was presented to Pat Smith, retired Executive Director of The Community Foundation. The Excellence in Public Service award recognizes an individual that demonstrates lifelong service and exceptional leadership skills which have positively impacted the Asheville area. Suzanne DeFerie, President and CEO of Asheville Savings Bank, presented the award. 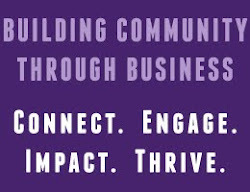 The Mission Hospitals Good Health-Good Business Award recognizes an outstanding senior management level individual in the Asheville business community that demonstrates service and exceptional leadership resulting in improved health of the Asheville community. The award was presented to Wilma Sherrill, former state representative, for her efforts in Raleigh to raise the money for the North Carolina Center for Health and Wellness at UNC – Asheville. Janice Brumit, Vice Chair of the Mission Hospital board, presented the award. The final award of the evening was the Chamber’s Volunteer of the Year Award presented by Four Seasons to Pat Fugate Hock, of Progress Energy. Hock served as a co-chair of the Chamber’s Total Resource Campaign this year which successfully raised over $425,000 to support Chamber programs. Hock has been a member of the Total Resource Campaign cabinet for eight years and has been one of the top fund raisers every year. The Volunteer of the Year Award was presented by the President & CEO of Four Seasons, Chris Comeaux. Also during the evening’s program the Chamber recognized the contributions and leadership of Chamber President & CEO, Richard Lutovsky. Earlier this year Lutovsky announced his retirement plans for September of 2010 when he will complete ten years as the Chamber President. Lutovsky’s decade of service was recognized by many community leaders including City of Asheville Mayor Terry Bellamy and Buncombe County Commission Chair David Gantt. Lutovsky was joined at the dinner by his wife, Janna; mother in law, Mrs. Janet McCoy; daughter, Mrs. Kelly McCracken, and granddaughter, Maya. Each award recipient was showcased by video, click here to watch the videos now. The videos were produced by Time Capsule Video. Ms. Alice io Oglesby, io design & illustration, will be installed as Chairman of the Board at the Asheville Area Chamber of Commerce’s 113th Annual Meeting on June 21, 2010 at the Grove Park Inn Resort and Spa. Oglesby will lead the Chamber in efforts for economic development, tourism, small business, education and other areas. Oglesby succeeds out-going chair, Mike Willett of BB&T. Oglesby plans to engage the Chamber membership to encourage participation in the many quality networking and educational programs the Chamber offers. Having years of experience owning a small business in our community, Oglesby understands the challenges local businesses are facing in these challenging times. The Vice Chair of Economic Development will be named at a future time. 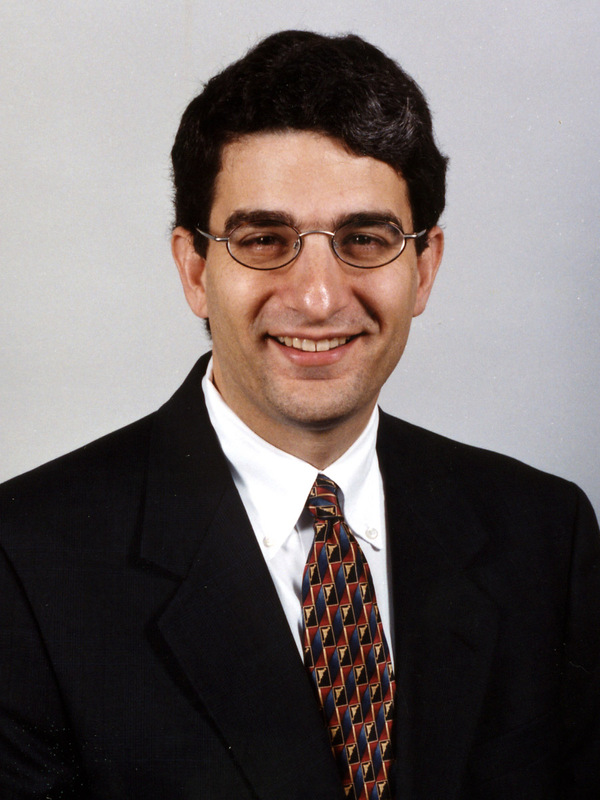 The current Chamber President & CEO, Mr. Richard J. Lutovsky, also serves on the Executive Committee. Mr. Oscar P. Wong, Highland Brewing Company, Inc.
Sundance Power Systems, a long-standing leader in establishing the regional renewable energy industry, is proud to be carbon neutral in their office and shop operations, and may well be one of the first companies in the Southeast to achieve this status. The term “Carbon Neutral” was named the Word of the Year by the New Oxford American Dictionary in 2006 when response to climate concerns led forward-thinking corporations such as Google and REI to embrace the concept as part of their proactive corporate policies geared towards sustainability. While the economic downturn slowed the momentum, clean energy investments are emerging as one of the most solid approaches to economic recovery, offering businesses a hedge against rising fuel prices while providing a profit center from clean energy generation and carbon credit markets. Being carbon neutral involves a calculation of total climate-damaging carbon emissions from operations, reducing them through conservation and efficiency measures where possible, and then either investing in clean energy technologies or purchasing carbon offsets through certified programs. Sundance’s strategy includes on-site renewable energy generation through a solar hot water system, a 10 kilowatt solar electric system, and a biomass boiler. The balance is offset through NC GreenPower credits. Sundance Power Systems, Inc. has been serving the Southeast with Renewable Energy Systems since 1995 and is based just outside of Asheville, NC. The Asheville law firm of McGuire, Wood & Bissette, P.A. is pleased to announce that The North Carolina Bar Association, in conjunction with the Citizen Lawyer Task Force, has named W. Louis Bissette, Jr. a 2010 recipient of its Citizen Lawyer Award. Formal presentation will take place at the North Carolina Bar Association’s annual meeting scheduled for June 24-27 at the Hilton Wilmington Riverside. The NCBA Citizen Lawyer Award was established in 2007 to recognize lawyers who provide exemplary public service to their communities. Honorees include elected and appointed government officials, coaches, mentors and voluntary leaders of non-profit, civic and community organizations. President of McGuire, Wood & Bissette, PA since 1999, Bissette has practiced law with the firm since 1976. He recevied his undergraduate degree from Wake Forest University in 1965, his law degree from the University of North Carolina School of Law in 1968, and a Masters in Business Administration from the University of Virginia in 1970. Bissette’s extensive civic and community service include two terms as Mayor of the City of Asheville, from 1985 to 1989. He has served as chairman of the Asheville Area Chamber of Commerce, the I-26 Corridor Association, the North Carolina Arboretum Society, and the Grove Arcade Public Market Foundation, and vice chairman of the Blue Ridge Parkway Foundation and the Buncombe County Economic Development Commission, and on numerous other boards and foundations. He is the current vice chairman of the Wake Forest University Trustees and a past trustee of Western Carolina University. He has helped the YMCA, Red Cross, Helpmate, Pisgah Legal Services, United Way, Habitat for Humanity, Industries for the Blind and other non-profit organizations raise funds for much needed services. Numerous awards for his dedication to community life include the J.D. Cooley Award from the Western North Carolina Community Development Association, the Citizenship Award from the Land of Sky Regional Council, the Big A and Chairman's awards from the Asheville Area Chamber of Commerce, and the Centennial Award from the North Carolina Bar Association. 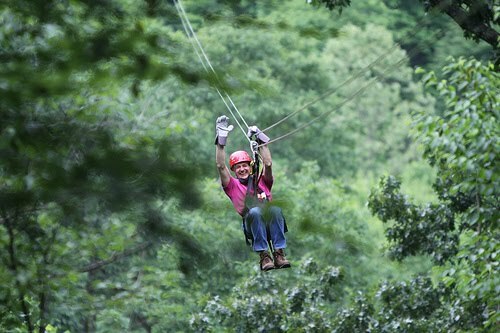 Navitat Canopy Adventures, a world-class zip line canopy tour near Asheville, is offering a special tour price discount to residents of western North Carolina. Throughout the season, locals who book Tuesday tours receive a 20-percent discount on the regular tour price. An ID showing proof of residency is required. NAVITAT showcases the breathtaking natural beauty of a 242-acre serene mountain cove, located just 20 minutes north of downtown Asheville. The canopy tour course is entirely tree-based and features two sky bridges, two rappels, and 10 zip lines ranging from 120 to 1,100 feet in length -- including one that sends guests soaring more than 200 feet above the forest floor. Regular tour price is $85 for adults, and $75 for children ages 10-17. Tours last approximately 3 ½ hours. To book your tour, call (828) 626-3700 or visit www.navitat.com. N.C. ARBORETUM MEMBER SPECIAL: Members of the N.C. Arboretum in Asheville, N.C., can show their Arboretum IDs and receive a 10-percent discount on the regular tour price throughout the season. The Grove Park Inn Resort and Spa is hiring, at all levels of employment. According to their website they currently have 49 position open, ranging from spa staff, area supervisors, or administrative assistants. See all the openings in this PDF or on the Grove Park Inn website here. A software application developed by a student team from Asheville-Buncombe Technical Community College won second place in the 2010 Juicy Ideas Collegiate Competition, a national contest challenging students to create a software application that uses publicly available data to benefit their community. The team’s Asheville-Outdoors.com application provides interactive information on activities available in the region for outdoor enthusiasts (http://www.youtube.com/watch?v=6hoU6PtUWP8). Stanford University narrowly defeated AB Tech with its “Truth or Dare” entertainment application (http://www.youtube.com/watch?v=QD6qx9Zu6e8) that allows users to discover and research leisure activities, from places to take a date, to the best cookie recipes for baking, to movies available from the closest video store. Students from MIT came in third. Juicy Ideas, designed to engage students in entrepreneurship and encourage innovation and creativity, was organized by AdvantageWest, the economic development group serving Western North Carolina, with support from Google and in partnership with DigitalChalk, developers of an online software platform for training and continuing education. “These students are engaged in the global community and their approach is very entrepreneurial,” said Pam Lewis, senior vice president for entrepreneurial development at AdvantageWest. "Technology-related enterprises are a core focus of the AdvantageWest entrepreneur program and we are excited about the future of this generation of entrepreneurs." AB Tech’s team members were: Mark Locklear, 37, of Maxton, N.C., captain; Steve Greenhoe, 52, of Mills River; Kaitlyn Lemmons, 16, of Asheville; Allen Smith, 26, of Black Mountain; and Brant Wellons, 30, of Matthews, N.C. All are technology majors with the exception of Locklear, who is enrolled as a continuing education student. Judges for the competition were: Erskine Bowles, co-chairman of the National Commission on Fiscal Responsibility and Reform and president of the UNC University System, Chapel Hill, N.C.; Eric Jackson, of Lab Escape, a Bostom-based data analysis and visualization company; Jenny Manner, chair of the Asheville technology organization, Meet the Geeks; Mary Radomile, educational programs for Google, in Mountain View, Calif.; Debesh Senapati, with the global investment firm Bain Capital; and Chris Sheehan, with the Boston investment firm CommonAngels. 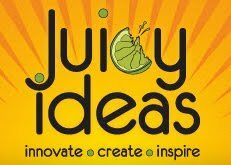 For more information and Juicy Ideas contest details, visit www.juicyideascompetition.com or contact Lewis at plewis@awnc.org or (828) 687-7234. 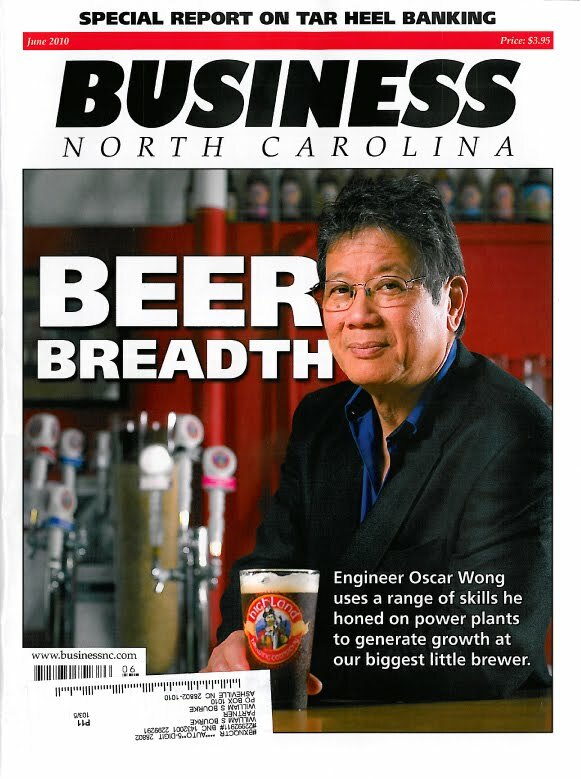 Read the story on Highland Brewing Company and Oscar Wong from this month's Business North Carolina here. Check out this video from last Friday's Chamber Challenge 5k presented by Dixon Hughes. The video was created by Time Capsule Video, who created the Spirit of Asheville video. Asheville Chamber Challenge from Time Capsule Video on Vimeo. Last fall the Membership staff at the Chamber had the opportunity to visit with Shannon and her team at Horse Sense of the Carolinas. We were so very impressed by the lessons we learned in just a few short hours with Shannon, below is a short video from Horse Sense OTC on communication.